Ultrasonic energy processing of DNA or chromatin samples is widely accepted as a better alternative than enzymatic digestion methods. 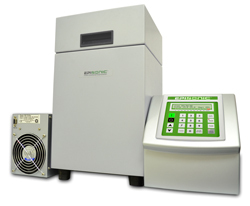 By emphasizing higher throughput processing and preventing sample contamination in our sonication technologies, our EpiSonic™ sonicators can be easily integrated into existing lab workflows and are also particularly suitable for compatibility with epigenetic and next-generation applications. Epigentek's EpiSonic™ has become an effective shearing device for preparing chromatin samples in the chromatin immunoprecipitation technique, as well as for library preparation of DNA for next-generation sequencing platforms. The affordability of the unit and its ability to multiplex samples makes it a cost-effective tool for every lab to own, not just for core facilities. The technology behind the EpiSonic™ sonicators is Digitally Adaptive Sonocavitation™ (DAS), a principle that is ideal for shearing DNA or chromatin as well as for lysing cells and tissues. DAS™ produces acoustic energy in a shallow amount of water, which creates millions of cavitation bubbles. The size of the cavitation bubbles and the corresponding cavitation energy can be manipulated and digitally controlled by adjusting fully scaled amplitude levels. As the cavitation bubbles implode after reaching sufficient size, intense shock waves are transmitted into vessels containing samples. This in turn forms highly targeted shearing forces to break up or disperse biomolecular samples including DNA, chromatin, and tissues in a non-contact, non-invasive manner. In a nutshell, a DAS™-based device such as the EpiSonic™ NGS is able to shear samples with more precision and reproducibility than non-DAS™ instruments.